Besides piloting a giant mech or a super fast spaceship I cannot think of a better use of VR than a good ol’ zombie apocalypse. Arizona Sunshine promised this but somehow managed to make killing zombies in VR not as fun as you’d think. 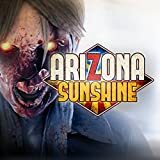 Arizona Sunshine is a story about a faceless, nameless protagonist who has holed up in the Arizona river valley to ride out the zombie apocalypse. With no more supplies and his camp compromised, he sets out on a mission to find other survivors. That’s pretty much it, no back story, no character development. Just a guy who spews one liners every minute for is own amusement killing Zombies in Arizona. At first the game seems promising, even with it’s very bare bones presentation, but you soon realize that making your way through this game is going to be more of a chore than it should be. In the Campaign mode, You move through the desert, picking up weapons and ammo from abandoned cars and other camps, following radio signals in hopes of finding other survivors. It can be completed in about 3 to 4 hours if you can stick with it. Also included is a Horde Mode where you have to fight waves of Zombies to get the high score. In theory, everything should be great fun to play alone or with friends, but where Arizona Sunshine begins to fall flat is with it’s horrid snap movement controls and very twitchy aiming. Moving anywhere in this game is not easy, and it’s not because of the zombies, but rather the snap movement of your character. Similar to the Tomb Raider VR mode and games like Sports Bar VR, you have to select where you want to go and then warp there immediately. It works for some VR games but not for an action game where you have to constantly defend yourself. Many times I warped into a wall or a gate, and even on a few occasions warped into a broken down car and got stuck. This type of movement resulted in many deaths, and even complete game crashes on rare occasions. A game like Arizona Sunshine requires the ability to move freely like you can in games like Farpoint for example. Snapping and warping just makes playing difficult and annoying. Playing with the Standard controller is completely out of the question, even though it functions, it shouldn’t even be tried. The standard controller will make shooting and aiming almost impossible. Using the Farpoint AIM controller (if you have one) or up to 2 Move controllers is much better, but it’s still not great, but at least you can dual wield weapons with 2 Move controllers. I managed to aim well enough with the Move to pull off some nice head shots sometimes, but most of the time it would take almost a full clip to take down a target. The graphics in Arizona Sunshine are nice looking for the most part, with a few strange textures and rather low resolution elements. However, everything is bright and very colorful. The character models of some of the zombies look a little bland and kind of blocky at times, with some strange clipping here and there. One zombie I fought got stuck in the floor after I shot off a leg and could no longer function properly, reminding me of something you would see in a Nintendo 64 game. The ambient sounds of the abandoned desert fill your headphones while the faint grunts and moans of the undead can be heard in the distance. This is kinda cool and gives you a eerie feeling when looking around, but it’s quickly halted with the unfunny quips from the main character. He seems to talk to himself A LOT and most of the time it’s not necessary. I really wanted to like Arizona Sunshine, but as it is I really have a hard time recommending it. The horrid snap movement controls and twitchy aiming make it very difficult to have fun with, even though the concept is sound. Everything this game does wrong, and games like Farpoint do much better, and the things this game does well are plagued by the mediocre presentation. I truly love the concept and some ideas that Arizona Sunshine presents, but overall, it’s just too broken of a game to get a high level of enjoyment out of.